Ah, the holidays: that festive time when Orleanians celebrate by driving our cars willy-nilly up onto the curb and demolishing more than our usual number of stoplights. One of my busiest neighborhood corners, where City Park Avenue crosses under Interstate 10, was without any stop lights for over a day where I routinely exit southbound then turn east toward City Park and home. Thankfully, the cheerful red and green have returned to this corner and it is safe once again to come in from Metry to tour City Park and enjoy the light show of Celebration in the Oaks, to sip lukewarm buttered rum in the steamy 70-degree December while wandering over to visit Mr. Bingle. To those of us who live by the park, the trees are full of the ruined reminders of the drive-through Xmas lights that once adored the south end of the park. Bits of wire and metal still hang from the trees like apocalyptic moss. The remains of a display in the lagoon where City Park meets Carrollton and Wisner Avenues look like the skeletal outline of some vague sea monster revealed by low tide. If you don't visit the park often but come for the Celebration, as you travel between the lights and your car look up to the trees for those remains of the celebration that was. It makes the celebration of lights that is that much more precious and important. Lights are important to us this time of year. It is not just the ancient act of turning the solstice, the universal myths of darkness and light in every culture north of the Tropic of Cancer, the stories and re-enactments and sacrifices to turn back the wheel of the year and return the sun. The primordial fears and hopes that fuel Hanukkah and the bonfires of my own Cote des Allemandes people and even my personal, petty desire to buy just one more string or twinkly thing for the house, all are inescapably imprinted on us not just by the collective unconscious but also by the events of the Federal Flood. I searched and searched in vain for an online copy of the the photo taken from near where the 17th Street Canal intersects Veterans Boulevard, the one that shows the spared suburban streets of Metairie brightly lit and contrasted with the abject darkness of the West Lakeview neighborhood just across the canal. It is startling to one who knows the area. Many know the skyline of the city from football coverage and other event. And that is what makes the picture below so disturbing: a major American city in the dark not for hours but for days, then weeks. If you find yourself watching the Sugar Bowl or the BCS championship this year, you will see this vantage at some point, I am certain . When you see the city festively lit for New Years, remember this picture. Remember how it was. I was not here to see my city entirely in the dark. I could only watch in near paralysis from more than a thousand miles away as days turned into weeks and weeks into months and still much of the city was a dark wasteland. This was not some transient outage, an inconvenience to fill a few minutes of the evening cable news. It was the loss of a key piece of what makes us modern. It was the breakdown of all of the infrastructure of post-industrial revolution life and the social contract it supports: a vision of what the end of America might be like, a dystopia that before was safely trapped in the covers of pulp novels and the reels of Hollywood movies. It was a darkness that was more than just the absence of light. It was the absence of civilization, its collapse in miniature. I remember when the President spoke in Jackson Square and they fired up generators to light up Jackson Square, even as the local utility Entergy was saying it was too soon to restore power anywhere. As the square lit up I swore a solemn oath that violates several laws of the United States even to utter aloud, regarding what I would do to George Bush if he burned down the French Quarter for a photo op. In the end, he did not. For all of his efforts, he has been as powerless to destroy us as he was to save us. For us the diminution of the light is not simply metaphorical. The fear that some power has stolen the light and that the world has turned for the last time, that there will be no return to the life of years past, such a fear has an immediate meaning to those who have seen their entire world upended, who have confronted the reality that they may be witnesses to the end time. And yet in December of 2005, just up the river from the darkness and disaster, the bonfires were built to light the night at the turning of the year as my people have done for almost 300 years. The persistence of life is its more important characteristic. A forest the size of Delaware can burn to the ground only to erupt again in wildflowers and saplings. I lost my faith in the conventional divine long ago. Still, the universal festivities of this season are inescapable, and they call to all of us--even the unfaithful--in deep ways tied to childhood and our collective human soul. After my decade in the far north, when I might enter and leave my basement office in bitter cold without a glimpse of the risen sun, I was reminded why this season is sacred to all cultures. To survive the darkness that threatens to swallow us we must light a candle rather than curse the darkness. We must huddle together with the rest of our kind, remind ourselves as best we can that this season will pass. We must band together and be merry. This last part I understand deeply. It is the core of the only religion I have left, the civic religion of being an Orleanian, a part of a people that parades in the face of death. Even as we decorate the tree in our house and I string the lights across the front, I cannot ignore the fact that there are still endless city blocks to my east, stretching for miles, where the darkness still reigns after two-and-a-half years, anymore than I can ignore the shortening of the days. That is my reminder even as the temperatures hover in the seventies by day that this is still the time of darkness. Even as the city comes slowly back to life, so many remain unredeemed, as displaced as the people of Israel marching from town to town at the command of a foreign government for purposes they barely understand. Here in the birthplace of their fathers and mothers, the city they would call home, they cannot be truly at home for there is no room in the inn. For their redemption, for the redemption of us all, I can offer only this: somewhere tonight in the East there is a light to light the world. In a neighborhood where the only other illumination is an irregular constellation of streetlights, in a place where the blocks are still largely dark and the vacant and the empty homes stand like rows of tombs: even there, a home is lit for the season and shines as brightly as the mythical winter star of two millennia ago. This light will lead the faithful and perhaps the odd wise man to a place where there is a miraculous rebirth, if they will only choose to follow. It is the light that can save them, that can save us all. Hey, I posted you onto today's NO News Ladder. 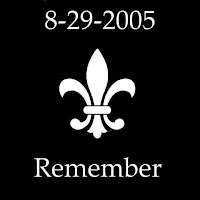 I was there in the darkness for six days and nights after the levees failed. It was so dark on Elysian Fields that you could not see your hand just in front of your face. There was also no distant glow of any light anywhere. No flashing red tower lights in the distance or glow from Metarie or anywhere. Later at night even the choppers would settle down. It seemed no stars, though I remember seeing a jet-liner way up high traveling east-west and wondering if they could even see New Orleans below. I doubt it. And I think it was on a new moon. Walking the dog: 1 eight-inch cerated produce knife in one ankle, another eight inch folded Buck knife in the other ankle, 2 three-inch folded bucks for the right belt, 1 two-foot long antique navy saber for the left belt, roll of quarters right pants pocket, mace left pants pocket, small mag-light on belt, large mag-light flashlight in hand, extra flashlight left back pocket, no loose change or dangling chains or anything that made noise, no shiny objects...just to walk the dog. Came in handy too. If I had had a gun I would be going to hell. Mele Kalikimaka a me Hao'oli Makahiki Hou! It's true, that darkness was SCARY. And the quiet, too -- no streetlights humming, no air conditioners, no traffic, it gave me the willies. What you said is I thought of .Here is some of new battery fpr your laptop. I was there to see the city entirely in the dark, i would have gone insane but my boyfriend and i lit all the candles in the house and had a really nice dinner, and watched movies on the laptops. Well actually 2 movies one on his one on mine then the batts went out, ha!